London, UK, 14 September 2012 – Sony today officially opened its newly built UK distribution centre in Enfield, North London – a provider of around a quarter of the UK’s home entertainment media­ – after the original building was destroyed by fire during the London riots in Summer 2011. The opening was attended by Prime Minister, David Cameron, who praised Sony for its efforts in retaining local employees through utilising the original site. The new, more advanced distribution centre was built against all odds in record time in order to be fully operational with stock for the peak Christmas sales period which accounts for 50% of annual revenue. It is operated by Sony’s global subsidiary Sony DADC, a leading production and distribution supplier of CD, DVD, Blu-ray Disc and digital media products for the international content industry. Around 25% of Britain’s total stock of home entertainment discs (like CD, DVD and Blu-ray Disc) was destroyed by the fire, which could have had a devastating effect on retailers as well as major and independent rights holders. 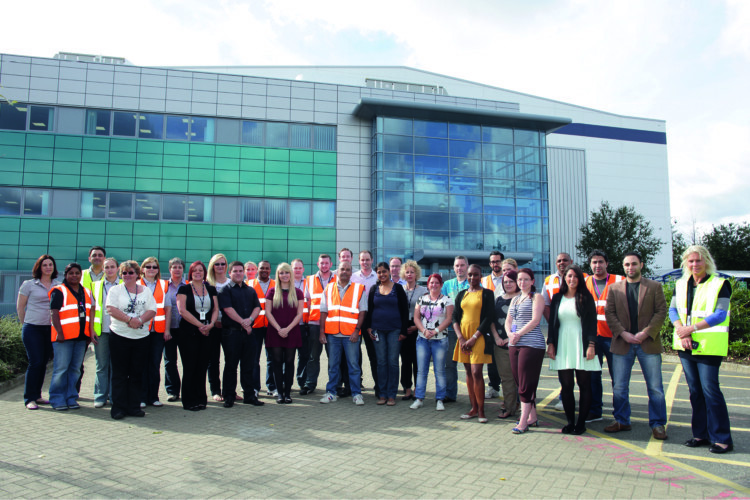 “Thanks to the dedication of our employees, contractors, suppliers and customers we have managed to pull off the impossible and re-establish our business in time for our busiest trading period and kept alive the businesses that depend on our services.” said Natasha Tyrrell, General Manager Distribution at Sony DADC UK who has spearheaded the recovery and development strategy. “It was the fastest ever build of its type in the UK with an overall construction and fit out period of 23 weeks. This enabled the site to become fully operational after just 11 months following the devastation caused by the arson attack”, stated the principle contractor ISG Retail. The new complex is 6.6 feet (two meters) higher than its predecessor, contains three office floors (one more floor than previously) stretching over 326,000 square feet (30,286 sqm) and incorporates high technology investment such as 4th generation conveyor and warehouse management systems. Especially recognising the need for top-level security, the Enfield site has adopted a new security concept that will increase the protection of staff, customer goods and the premises. The new distribution centre provides a peak throughput capability of approximately 1.2M units and can currently cater for around 55,000 titles per day, shipped to 20,000 retail addresses all over the UK and Ireland. As with the previous distribution centre, the service portfolio consists of physical handling and packing, testing and verification, distribution planning as well as financial services. Now, with an increasing focus on offering B2C distribution and retail services in addition to B2B services, Sony DADC is well equipped to accommodate an expanding product and services portfolio, future-proofing itself against an evolving industry. The UK distribution centre is part of Sony DADC’s global network that comprises approximately 30 sites in 19 countries worldwide. Just two days prior to the opening in Enfield, on September 12, Sony DADC opened its new, larger Central London office location at 20 Rathbone Place due to the increasing demand for Sony DADC’s digital media distribution services. Serving as the main European hub for Sony DADC New Media Solutions, the 20,000 square foot digital media facility offers clients a central location and integrated global network infrastructure. It combines physical and digital creative services and supply chain solutions under one roof to provide greater efficiencies and better client support across all lines of business. Offering an integrated entertainment experience through its electronics, mobile, music, pictures, game and the Sony Entertainment Network, Sony is uniquely positioned to be one of the world’s leading consumer brands. Sony is renowned for its audio-visual products in both the consumer and professional markets, such as the BRAVIA™ LCD high-definition (HD) television, Cyber-shot™ digital camera, Handycam® camcorder, “α” (pronounced Alpha) digital SLR camera, Xperia™ Tablet and Walkman® MP3 player as well as its VAIO™ personal computers and 3D HD professional broadcast equipment. For more information on Sony Europe, please visit www.sony-europe.com. For more information on Sony Corporation please visit www.sony.net.